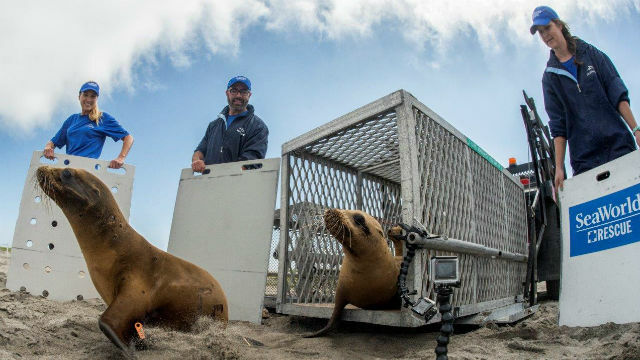 Nine sea lions that were malnourished and dehydrated when they washed up on area beaches were returned to the ocean Friday by SeaWorld San Diego. The sea lions spent two to three months being rehabilitated at the park’s animal rescue center. So far this year, SeaWorld has rescued 365 marine mammals, about twice as much as a normal year. A record high for rescues was set last year, with El Nino being blamed on the difficulty of younger sea lions to find food. According to SeaWorld, sea lions hydration comes from the food they eat, so if they’re malnourished they also get dehydrated. They’ve generally been lethargic when found, and some have suffered from hypothermia, hyperglycemia, pneumonia and other illnesses associated with weakened immune systems. Animal care staff hydrate and feed the sea lions and, if necessary, give them antibiotics. Once they’re back to a normal weight, free of infection and can forage for food, they’re eligible to be returned to the ocean.